On September 5th, 8:42 a.m. local time (14:42 GMT), an earthquake of magnitude Mw=7.6 occurred in the subduction zone of the Cocos Plate beneath the Caribbean Plate under the Nicoya Peninsula (shown by an yellow arrow in Fig. 1) of Costa Rica. 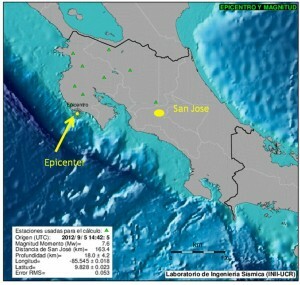 The epicenter was located at about 160 kilometers west of San Jose, the capital, and at a depth of 18 kilometers, according to LIS, as shown in Fig. 1. Fig. 2 illustrates the distribution of seismic intensity scale. This article briefly reports the findings made during the author’s recent site investigation. An earthquake in the Nicoya Peninsula with a magnitude of 7.5 had been predicted by seismologists of the Observatorio Vulcanologico y Sismologico de Costa Rica (OVSICORI) since the early 1990’s (Protti, 1998). The prediction was apparently fulfilled by this event, since it coincided in magnitude and location. However, after the earthquake Protti himself denied it was what he had predicted. Additionally, just days after the event, the seismologists of the OVSICORI issued a public statement announcing that there could be still sufficient stored energy to produce another earthquake of similar magnitude, spurring a scientific public polemic. The earthquake produced the highest recorded seismic acceleration in the short history of this country, reaching a peak of 1.8 g in the maximum horizontal component at the town of Nosara, near the epicenter (Fig. 3). In spite of the high peak acceleration, important structural damage in the epicentral area all but existed (see Fig. 4 for response spectra), and the earthquake hit mostly non-engineered constructions, sending nearly 1500 people to shelters and leaving some 200 people homeless. Although there were reports of liquefaction in some beaches of the peninsula and along the Pacific coast (Figs. 5, 6, and 7), there was no associated damage since the alluvial deposits occupy a relatively small area and are generally thin. Fig. 1. Location of epicenter. Source: Laboratorio de Ingenieria Sismica, University of Costa Rica.